One of the biggest questions this time of year for Jews is whether Thanksgiving is a kosher holiday. Can and should Jews celebrate Thanksgiving? 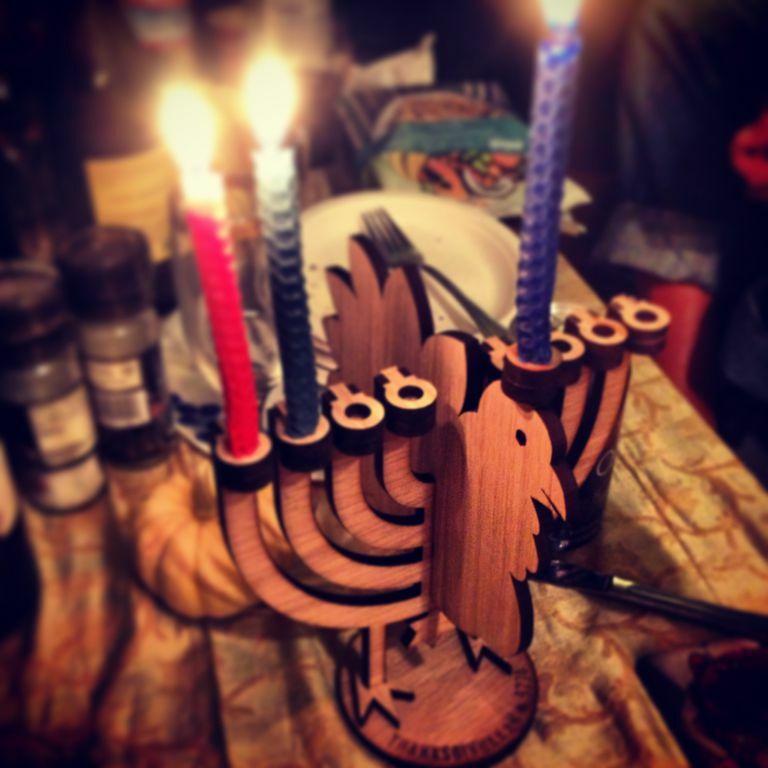 How does the secular, American holiday fit into the Jewish experience? In the 16th century, during the English Reformation and the reign of Henry VIII, the number of Church holidays was drastically decreased from 95 to 27. However, the Puritans, a group of Protestants that fought for further reforms in the Church, sought to completely eliminate church holidays in favor of replacing the days with Days of Fasting or Days of Thanksgiving. When the Puritans arrived in New England, they brought these Days of Thanksgiving with them, and there are many documented celebrations of thanks during the 17th and 18th century following the end of bad droughts or successful harvests. Although there is much debate about the specifics of the first Thanksgiving as we know it today, the commonly accepted belief is that the first Thanksgiving occurred sometime in September-November 1621 as a feast of thanks for a bountiful harvest. After 1621 and until 1863, the holiday was celebrated sporadically and the date varied from state to state. The first national day of Thanksgiving was proclaimed by President George Washington on November 26, 1789 to be a "day of public thanksgiving and prayer" in honor of the forming of a new nation and new constitution. However, despite this national declaration, the holiday was still not celebrated regularly or consistently. Then, in 1863, at the prompting of a campaign by author Sarah Josepha Hale, President Abraham Lincoln set the date of Thanksgiving officially to the last Thursday in November. However, even with this proclamation, because the Civil War was in full force, many states refused the date as official. It wasn't until the 1870s that Thanksgiving was celebrated nationally and collectively. Finally, on December 26, 1941, President Franklin Roosevelt officially changed Thanksgiving Day to the fourth Thursday in November as a means of boosting the U.S. economy. At first glance, it appears that Thanksgiving is a religious holiday founded by a Protestant sect, even though they were attempting to minimize the role of church-based holidays. Although in the 21st century Thanksgiving has become a largely secular holiday chock full of football and belt-busting feasts, because of the holiday's potential origins as Protestant, there are several issues that the rabbis address to decipher whether celebrating this holiday presents a halachic (Jewish legal) problem. The Maharik and Rabbenu Nissim conclude that only customs based in idolatry are prohibited, but secular customs that are considered “foolish” are permitted with reasonable explanation. Rabbi Joseph B. Soloveitchik also stated that Thanksgiving was not a Gentile holiday and that it was permissible to celebrate with turkey. Rabbi Yitzchak Hutner, on the other hand, ruled that whatever the origins of Thanksgiving, the establishment of a holiday based on the Christian calendar is closely tied to idol worship and thus is prohibited. Although he advises Jews to distance themselves from these customs, this is not widely practiced in the greater Jewish community. Judaism is a religion devoted to the act of gratitude from the moment an individual wakes up and recites the Modeh/Modah Ani prayer until he or she goes to sleep. In fact, it is believed that the Jewish lifestyle provides for the recitation of at least 100 prayers of gratitude every day. Many of the Jewish holidays are, in fact, holidays of gratitude and thanks—like Sukkot—which makes Thanksgiving a natural addition to the Jewish year. Believe it or not, Jews celebrate Thanksgiving just like everyone else, with tables overflowing with turkey, stuffing, and cranberry sauce, but likely with a bit of a Jewish touch and attention to the meat-milk balance (if you keep kosher). Even Jewish Americans living in Israel get together to celebrate, often ordering turkeys months in advance and going out of their way to find American staples like canned cranberry sauce and pumpkin. If you want a more formal approach to your Jewish Thanksgiving celebration, check out Rabbi Phyllis Sommer's "Thanksgiving Seder." In 2013, the Jewish and Gregorian calendars aligned so that Thanksgiving and Chanukah fell in sync and was coined Thanksgivukkah. Because the Jewish calendar is based on a lunar cycle, the Jewish holidays fall differently from year to year, whereas Thanksgiving is set on the Gregorian calendar as the fourth Thursday of November no matter the numerical date. Also, Chanukah is a holiday that lasts eight nights, offering a bit of room for overlap. Although there was much hype that the 2013 Anomaly was the first, last, and only time that the two holidays would ever coincide, this isn't exactly true. In fact, the first occurrence of the overlap would have been on November 29, 1888. Also, as late as 1956, Texas was still celebrating Thanksgiving on the last Thursday in November, meaning that Jews in Texas got to celebrate the overlap in 1945 and 1956! Theoretically, assuming no legal holiday changes (like that in 1941), the next Thanksgivukkah will be in 2070 and 2165.